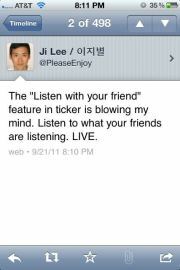 "The 'Listen with your friend' feature in ticker is blowing my mind. Listen to what your friends are listening. LIVE." The tweet has since been deleted, but not before some followers were able to grab screenshots. "Listen with your friend" could be part of a new music feature that Facebook is widely expected to unveil at f8. It's been reported for weeks that Facebook Music would launch, perhaps through partnerships with several existing streaming services. Facebook metadata was spotted over the weekend in the code underlying Spotify, Rdio, MOG, SoundCloud, Deezer, and Rhapsody. If Facebook introduces some sort of group listening or "listening with a friend," as Lee calls it, it won't be groundbreaking. People have been listening simultaneously to the same ShoutCast station as their friends on IM and chat for more than a decade, and social/sharing features have become a prerequisite for any music streaming service of late. What would be most different with Music on Facebook is simply that it would be on Facebook, with its 700 million users. What do you think? Would you listen to music with your Facebook friends?